In thinking about Christmas, children are immediately brought to mind. So many children in the Missions live with immense suffering, poverty, violence and all the related challenges. Thanks to the work and witness of Religious Sisters, these children also come to experience the message of God’s great love for us all, the “Good News” proclaimed by the angels that first Christmas. In the Missions, at Christmas and throughout the year, there are countless children who need the care of the family of God. In so many of these places, they find that loving heart in the words and actions of Religious Sisters. How can you make a difference for these children and the Sisters who bring them Christmas joy every day? Your prayers are your first and greatest gift. Your financial support is needed as well. Whatever sacrifice you can make will be a blessing for the Missions – and most appreciated, especially in these challenging financial times here at home! May you and your families know great joy and experience our Lord’s boundless love at Christmas and throughout the New Year! One lesson taught through programs of the Holy Childhood Association is that of offering up your time and talent as well as your treasure for children in the missions. Believe it or not, the treasure is the easy lesson! When the children are handed a Mite Box or Coin Folder in Advent or Lent, they know what to do – fill it with sacrificed treasure. They do this by giving up sodas or candy bars, offering part of their allowance, doing extra chores for payment or emptying their pockets of spare change every day. Sometimes, the time and talent offerings require a little more prayerful thought. When I visit the schools, they hear suggestions: if they sing or play musical instruments, they could visit a nursing home with friends and put on a concert, offering up the time spent for children in the missions who don’t have access to music lessons because their school (if they have one) barely has the basics. They can stand at the lunch room door and hold it, letting everyone go first, knowing they may not get a seat with their friends and by the time they get in, the French fries might be cold, or worse – gone! If they say a prayer as they stand there, offering their time for children in the missions who won’t eat that day, they are sacrificing for the missions just as concretely as any coin offered. At this time of year, the Holy Childhood Association gives Catholic children another opportunity; we invite them to enter our Christmas Artwork Contest. By spending time and using their talent to draw a picture of a Christmas scene, children can enter a contest to have their work used as e-greetings on our National HCA website (www.hcakids.org). The Grand Prize winner’s art is made into the Christmas card used by HCA National Director Msgr. John Kozar. Winners’ artwork also hangs in the Basilica of the Immaculate Conception in Washington D.C. during Advent. Rules and entry forms can be found on our website: www.propfaithboston.org. Click on the Holy Childhood page, then the Christmas Artwork page. For more information, email mheil@propfaithboston.org or call me at 617-779-3871. Deadline for entry is January 31, 2010. As a mother, I worry about the difference between nagging and nudging; when I nag my children, I’m making demands, often being critical of something they have not done. When I nudge them, I’m getting their attention in a gentler manner. I am still (hopefully) prodding them into action. During Advent, the students of St. Mary of the Hills School in Milton are allowing the national programs of the Holy Childhood Association (HCA) do just that – nudge them further into motion for the missions. The students are praying and making personal sacrifices so young people everywhere will come to know about Jesus’ message of hope, peace and love. For the students at St. Mary’s, however, no nagging was necessary! These mission minded youngsters started off their school year by becoming members of the Holy Childhood Association. They received their Fall Newsletter and learned about the way their counterparts live, learn and love God in Thailand. Next, the school hosted a mission visit from our office. That day, the students learned they weren’t missionaries because they were HCA members but because they were baptized! They learned they have had a privilege not afforded to over 1 billion people on our planet – that of hearing the Good News of Jesus Christ proclaimed to them. St. Mary’s students found this unacceptable. With their missionary momentum building, the students decided to have a bake sale, offering up for the missions their time and talent of cooking, baking and assembling saleable sized bags of tasty treats. Proceeds went to the missions of Haiti. 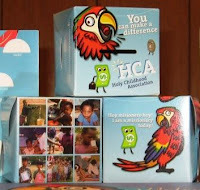 As Advent arrived, so did the HCA Mite boxes along with the Teacher’s guides. The guides are filled with mission prayers and activities (focusing on the children of Nepal this time) to remind members of the need to stay “awake” during this season; Jesus needs each one of us, children included, to be ready to show Him to the entire world one person at a time if necessary! By being active members of the Holy Childhood Association, the young people of St. Mary of the Hills School are nudging each other to share the love of Jesus. How will you share His message this Advent? As Catholics, our faith tells us that Advent is a season of preparation. 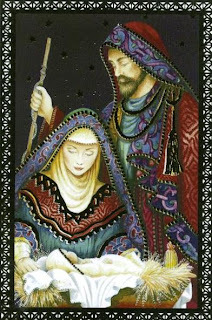 It’s a time to begin anew, to ready ourselves for the presence of the Christ Child in our hearts. Our society, however, pulls us in another direction and we find ourselves faced with the same question each year as Christmas approaches: what new ideas can we come up with for all those hard to please people on our lists? Surely Uncle John doesn’t NEED another pair of argyle socks. How many more scarves can Aunt Nancy use? More importantly, is there a better, more faith filled way to bring happiness to our loved ones as we celebrate the real meaning of Christmas? At the Propagation of the Faith, we believe that giving the gift of hope to those who live in mission countries is a great way to tell your friends, family and the world that you love them and your Catholic faith. 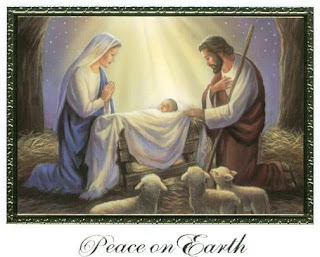 For a donation of $5.00 each, Christmas Mass and Novena Enrollments are available. By choosing to support the missions, your gift helps untold numbers of people. Most obviously, it benefits the intentions of the person for whom the Mass or Novena is said. But your gift also makes it possible for us to send Mass Offerings to missionary priests who say them. Some of these Offerings will also be sent to the International Secretary General of the St. Peter the Apostle Society, Msgr. Jan Dumon at the Vatican. It is his job to oversee the Pontifical Mission Society which partners with the Propagation of the Faith to raise up a local clergy in the missions. Msgr. Dumon tells compelling stories of turning away applicants at mission seminaries for a sad reason: there is no money to pay the professors. Your gift to the missions this Christmas could enable a young man to say “Yes!” to God’s call to the priesthood, thereby enriching the whole Catholic family. For more information about giving the gift of hope and faith in Jesus Christ to your loved ones and the missions, please call 617-542-1776 or email us: info@propfaithboston.org. As we celebrate Thanksgiving, our Mission Family gives thanks for many things. We are thankful to serve the people of God both here in the Archdiocese of Boston and throughout the mission world. Mostly, we are prayerfully indebted to you, our donors. Without the sacrifices and prayers made by the members of the Pontifical Mission Societies, our work would be impossible. Some of the first donations to the Propagation of the Faith were sent to one of the greatest mission lands of the time – the United States of America. Sent to help build churches and schools and train priests, these monies were concrete evidence of the belief of 19th century Catholics that we deserved a chance to know the Catholic faith. Here in the U.S., we continued to receive support from the Propagation of the Faith until 1908. We are now the largest donors in the world to that Society, helping over 1150 mission dioceses have the same start on the road to faith that was afforded to us. Every week, we gather for Mass in our home parishes in the Archdiocese; our children receive their sacraments regularly and there is clergy present to offer prayers over the graves of our loved ones. This is a privilege not shared by all Catholics and one that the Society of St. Peter the Apostle seeks to correct by helping to raise up a local clergy in the missions. With your donations, seminaries and houses of religious formation for men and women are built; scholarships are given to worthy candidates. Children are often referred to as the future of world. We believe that they have a faith job -- a mission-- now. As members of the Holy Childhood Association, our children are learning that their brothers and sisters in Christ need their prayers and sacrifices so that they may share the blessings common here—those of clean water, education, and the knowledge that Jesus loves them. Young and old, clergy and laity, spiritual and material support: for all these things, we are grateful. They make us One Family in Mission. Labels: "Holy Childhood Association", "Pontifical Mission Societies", "Propagation of the Faith". St. Peter the Apostle"
Recently, we were visited in the Mission Office by Bishop Stanley Roman of the Diocese of Quilon, India. Bishop Stanley had travelled over 30 hours to reach us from his home on the western tip of the Indian peninsula. He did so to participate in the annual Mission Cooperative program sponsored by the Propagation of the Faith in parishes around the United States. As part of our support of the over 1150 mission dioceses around the world, Bishops, priests, sisters and lay people who work for the spread of the Gospel are assigned specific parishes in which to speak each summer; the collection given goes directly to their work. While Bishop Stanley told us that he could not run the programs of his Diocese without this help and the support he receives every year through our International Office in Rome, he said the purpose of his visit was to thank the people of the Archdiocese of Boston for their regular support through Mass Stipends sent to him by our office. The Bishop told us that most of the 250,000 Catholics in his Diocese are poor, working in the fishing industry, living in substandard housing. They are served by close to 100 priests who often receive no salary for the work they do within their parishes. Because of this, the regular Mass stipends sent to Bishop Stanley from this office, made possible by the Catholics of Boston who purchase Mass Cards and Spiritual Enrollments from the Propagation of the Faith, whether by telephone, mail or our website, allow the priests of Quilon to support themselves as they offer Masses for the intention of the donor. This makes the donor a literal lifeline for that priest. For more information on how you can help us support more missionaries through Mass Stipends, please call 617-542-1776, email info@propfaithboston.org or click here. Recently, an email came in that was an education to us all; it showed what can be done with a lot of faith and and a lot of organization! In communication with Fr. Bernard Makadani, the National Director for all four Pontifical Mission Societies in Zambia (http://www.pmszambia.org), we learned of a special event -- the 10th anniversary of Holy Childhood Association (HCA) participation in the Archdiocese of Lusaka, Zambia. Fr. Bernard as well as the teachers and catechists there are busy teaching their children that to be a Catholic is to be a missionary. It's spreading the Gospel to those around you, but it's also helping those who have never heard of Jesus come to know Him. This lesson is very real to the children of Lusaka, members of an Archdiocese that is 50 years young -- they are still dependent on help from the Pontifical Mission Societies for parts of their daily life. And yet these children are learning, through their membership in HCA, that a Greater Story exists outside their own. And so, they came. Six thousand of them, dressed in the colors of the World Mission Rosary came to hear about the children of the different continents that their clothing represented. They came to hear what their own responsibilty was to all God's children to make sure that they have the opportunity to know that Jesus loves them. Greetings to you from Zambia. On 12th September 2009, the Archdiocese of Lusaka celebrated the 10th anniversary of the Missionary Childhood in the Archdiocese, which herself is celebrating her golden Jubilee, 50 years of carrying the treasure of faith. We celebrated with joy, gratitude and hope the gift we received, the gift we continue to share: The gift of our Faith. Thousands of children attended the event. The children filled the 6000 sitting capacity Cathedral of the Child Jesus as you can see from the pictures. The anniversary was a moment for the children to renew their commitment. They are indeed the treasurer of the Church. They love the church, accompany her, showing her the path of joyful generosity, giving her confidence and opening new paths for evangelization towards those who have not received the Good News. 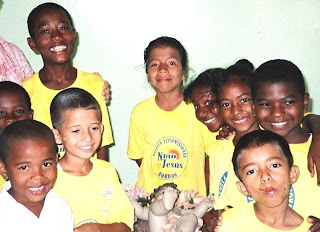 The missionary childhood are showing the way: Children in Mission like St. Paul celebrating their 10th anniversary in the Golden Jubilee of the Archdiocese. I am very happy to be part of the Holy Childhood Association. Happy for being a missionary with them! Happy because the future is bright, it is in their hands! Another 50 years, we will certainly have a new, more missionary Church rooted in the lives of these children. The faith of the children is enriching the family of God with so much cheerfulness and creativity. Indeed in the Church is embracing them with gratitude. Together, lets keep helping the children live and spread the gospel. Today, they must be missionaries at home, among their friends, at school, .... always ready and open to the horizons of the whole world. The pastoral care to the children offers two services to the children. The first principle is missionary education and the second is the promotion of the missionary cooperation with children of the whole world. Through this children become principle agents of the pastoral missionary activity. They receive missionary education and acquire the missionary spirit. May God bless all the missionary children, their animators and all those who support them and pray for them. Here in Boston, we have always been proud of the missionary spirit that has been fostered among us. May that Spirit continue to thrive among our children as it blossoms and grows in Zambia's children as well. Throughout the centuries, Catholics have followed the praiseworthy custom of requesting that Mass be celebrated for themselves or for loved ones, living or deceased. By enrolling yourself or your loved one in Membership in the Society for the Propagation of the Faith, you give an ongoing gift to the new Member and to the missions. 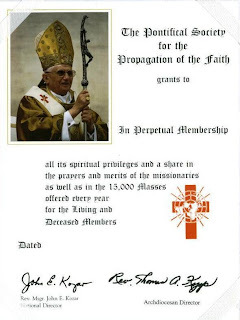 Membership means that a mission priest will celebrate Mass for the person enrolled. As he does so, this priest unites the Society Member with himself and his congregation - a clear sign of the universality of the Church! Members are also included in the intentions of a Mass said daily at the Basilica of St. Peter in Rome for all donors to the Pontifical Mission Societies, living and deceased. For many mission priests, Mass Offerings are a substantial means of day-by-day support. These men, ordained for the universal Church, are serving the poorest of God’s poor, often depending upon Mass stipends collected from Members of the Propagation of the Faith for the daily operation of their parishes, schools, health clinics and quite often for their own daily bread. Membership cards and folders are available for various lengths of time (one year to perpetual) and at various prices. Mass cards used to mark birthdays, anniversaries, and sacramental celebrations, to say thank you or pray for healing also help us to support priests doing vital work in more than 1150 mission dioceses around the world. For more information on Spiritual Enrollments and Mass Offerings, please call 617-542-1776 or email info@propfaithboston.org. To view sample cards and download an order form, go to our website at http://www.propfaithboston.org/Boston/propfaith_mass_offerings.html. 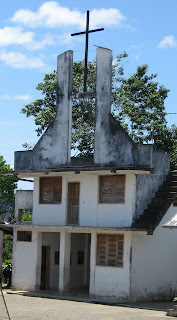 This story came to us via the CNVS (Catholic Network of Volunteer Services: http://www.cnvs.org/ ). Their Executive Director, Jim Lindsay was with us a member of the U.S. delegation to the Pan-American Mission Congress in Quito, Ecuador in August 2008. We also had the priveledge of spending time with Jim at the recent U.S. Catholic Mission Association Conference in New Orleans (more on that in a later post). The CNVS has 1098 lay missioners serving internationally in 108 countries. The following story was written by one of those missoners, Carolyn Polinsky, who served in Mexico as a volunteer with the Incarnate Word Missionaries. I ask that to Him, as Jesus is right in front of me. It is the Feast of Christ King and I am an Incarnate Word missionary in Mexico who lives in a house attached to a chapel. This morning, a group of parishioners stopped by our house and removed the statue of Jesus. 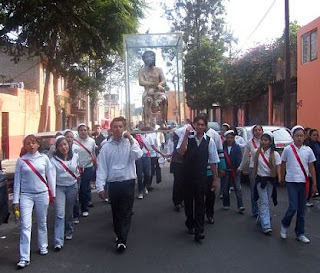 Now I am part of a procession walking through the streets of Santa Fe carrying Jesus while singing, praying and chanting. Before coming to Mexico, I wasn´t particularly active in organized religion. One of the reasons I choose to participate in a Catholic volunteer program was because I wanted to grow in faith. I ended up living in an area full of devout, active Catholics and if I were a missionary in the way the term is commonly construed-one who prostelytizes to non-believers-there wouldn´t be much to do. Instead, I see being a missionary as sharing love made possible by God and faith. Still, it´s a bit odd that I am wandering through the streets of a Mexican slum along with people who (with Jesus on their backs) took it upon themselves to stop and direct traffic before acquiring police cars as escorts. No one else seems to find it unusual. I reminisce back to a few months ago when I spent Sundays at the movies or shopping, and Mass was something to get over with. Now, I spend complete Sundays at the parish or involved in situations like this. I am in an introspective state as I awoke with a headache and toothache. I didn´t quite feel up to walking, but came out of curiosity and because it seemed expected. I speak little Spanish, and I am in the back of the procession as I don´t have the energy to keep up or to try and converse with anyone. I end up chatting with Antonio who is dawdling behind. He is a fifty-five year old homeless man that Padre took in to live at the Parish. He has a low IQ. Our conversations usually consist of him repeating ¨Como estas?¨ and ¨Que bonita Caro¨ over and over. He talks and I nod without understanding what he saying. Though I sometimes get frustrated with him, I like that there is no pressure to our conversations. He is happy to be talking with someone even if he is not understood. A big part of my life since coming here has been being part of a community that spends time or lives at the Parish. Padre surrounds himself with all types of people, including many who have difficulties finding a place in society—those with mental and developmental problems, divorced women, and young adults struggling to find a place in the world. I admire the priest for being so accepting toward others and try to follow his example, while realizing that I am blessed, as a foreigner, to be part of such a welcoming environment. The procession goes past the home run by the Missionaries of Charity, where I spend most of my time volunteering. Women and children live there because they have no one else to take care of them and most have severe physical and developmental handicaps. At first I felt uncomfortable around the wheelchair bound women because their suffering and inability to communicate is heart-breaking. Now, I have developed a rapport with residents, and have learned to read their expressions when they want something—to be hugged, to go on a walk, to drink water, to have their hands held. What I have realized is that it doesn´t matter why the women are in the state they are in or if I might do more good somewhere else. Right now, they are in need of love and I have been called to love them and it is in them that I most often see Christ. I am somewhat grateful for my (small in comparison) health and communication problems because it gives me much greater empathy toward those I serve. The walk continues past a group of men who stand on a dead-end street drinking cheap liquor. I exchange hellos with them and decline an offer to take a swig from an open container. I was introduced to them by a parish worker involved in cleaning up the streets and I make an effort to talk with them when I see them. It is the kind of situation I would have crossed the street to avoid in the United States and now I realize I shouldn´t have to hold the title of missionary in order to reach out to people whose lives have taken unfortunate turns. Overall, the March lasts for three hours, during which time parishioners share snacks and buy water for me. 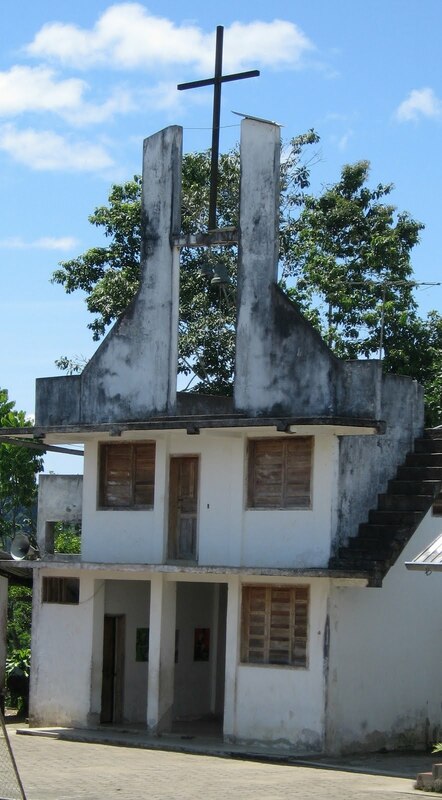 We attend Mass and then proceed back to my house where someone rings the bells on the roof as Jesus is returned. Fifty people run up and down our stairs and my roommate Jessica and I prepare coffee and sweet breads for everybody. This year, the student members of the Holy Childhood Association are hearing a very special message: they are being sent! In John’s Gospel, when Jesus appeared to His disciples after the Resurrection, He told them “As the Father has sent me, so I send you.” He didn’t say it to every other one of them or to only the ones who felt qualified for the job; He said it to ALL His followers. And so this school year, the Holy Childhood Association is reminding students not only here in Boston but across the country that they have a mission –they are being sent to make Jesus known to the ends of the earth. 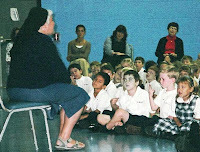 On a recent visit to St. Joseph School in Holbrook(http://www.stjosephholbrook.com), I had the opportunity to speak with HCA members about how this can be carried out in their lives on a very practical level. We all agreed that the “ends of the earth” can sound pretty overwhelming, if not downright impossible for kids. And yet, that’s what Jesus is asking of them if they are to live their Catholic faith fully. What could He be thinking? We took a few minutes to think about and discuss it – where is the ends of the earth? The list was long: China, South Africa, India, Venezuela, Thailand…was anyone in the room headed to any of those places today? No. Well, where WERE they going? A second list was made: hockey practice, dance class, piano lessons, cheerleading, home. Could it be that for today, THOSE places are the ends of the earth? We agreed that they were -- for that day, for those children, Jesus expected them to carry His Good News to the ends of THEIR earth. So, how could the Gospel be spread in those places? A final list came: we can play fair, try our hardest, help others struggling to learn skills, be cooperative and loving. Through the Holy Childhood Association’s programs, students not only at St. Joseph’s, but those in Catholic schools and parish religious education programs across our Archdiocese are being formed to be missionaries. They are being sent to the ends of their earth and beyond. Where is Jesus sending YOU today? For the approximately 600 people who braved the elements to gather at the Cathedral of the Holy Cross to celebrate World Mission Sunday on October 18th, there could only be one answer: TO THE ENDS OF THE EARTH! Whether it was to the flag bearers in the Procession of Nations, the ethnic choirs and representatives of their communities who served as lectors, readers and gift bearers -- the call that went out was plain: we are all called to be missionaries by virtue of our Baptism. Our Mass began with a Welcome Statement from Cardinal Sean O’Malley, read by Fr. Kevin O’Leary, Rector of the Cathedral of the Holy Cross and our host for the day. Cardinal O’Malley asked all present to remember in their prayers all those people in the world who have yet to hear the Gospel proclaimed and the Missionaries who serve them with help from the Propagation of the Faith. Many of those gathered in the pews were missionaries themselves – men and women who have answered God’s call and were sent to serve Him in faraway places; in doing so, they made sacrifices about which most of us will never know. We focused on one of these very special people during our Liturgy: Fr. Jim Hennessey. A priest of the Archdiocese of Boston, Fr. Hennessey was sent to serve the Missions in the South Pacific during World War II and was taken prisoner. He died on a P.O.W. transport ship, giving his life so that the people of the Solomon Islands could hear the Gospel proclaimed. Fr. Hennessey’s personal possessions were recently found and gifted to our Boston Mission Office by Archbishop Smith of the Solomon Islands as a token of thanks, not only for the gift of this great missionary and his life, but also for the ongoing help that the Propagation of the Faith sends to his Diocese from ours. Fr. Hennessey’s chalice, ciborium, paten and burse were on display at our World Mission Sunday celebration along with a portrait of the man. At the end of the Liturgy, we were all sent, as we are at the end of every Mass, “…to love and serve the Lord.” It is a privilege, here at the Propagation of the Faith, to make every attempt to do so – even to the ends of the earth! If you saw last week’s entry, you read that everyone in the Archdiocese is invited to join our One Family in Mission as we celebrate World Mission Sunday on October 18th at the Cathedral of the Holy Cross in Boston at 11:30 AM. Cardinal Sean O’Malley will be our principal celebrant and homilist. We have invited Bishops, priests, deacons, Religious Brothers and Sisters and lay people from across the Archdiocese and around the world (missionaries all, by virtue of their Baptism!) to be a part of our Eucharistic celebration. We hope you are able to join us as we join our prayers with those being said around the world for the Missions. We would not have been able to accomplish this task of planning for our World Mission Sunday celebrations without the generous cooperation of the Missionary Alliance; this is a group of Mission sending orders, along with the Propagation of the Faith, based in Boston. We have one common goal – the spread of the gospel of Jesus Christ through mission education and support. After a lifetime spent at work in the Lord’s vineyard, these great people are now hard at work bringing the missionary message to the people of our Archdiocese, in schools and parishes, in cooperation with the Pontifical Mission Societies. 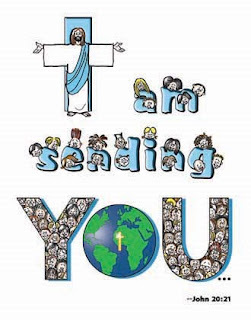 When you celebrate World Mission Sunday, whether it be at the Cathedral or your home parish, please take a moment to say a prayer of thanksgiving for all those people who answer God’s call to work for the missions in whatever way God calls them – even stuffing envelopes! Part of our “One Family in Mission” Team here in the Pontifical Mission Societies’ office is Sr. Lisa Valentini, a Missionary Sister of the Most Sacred Heart of Jesus. Sr. Lisa has been visiting the Archdiocese over the summer – many of you have had the pleasure of hearing her speak in your parish as part of the Propagation of the Faith’s Missionary Cooperative Appeal. The MSC Sisters serve in 22 countries around the world; much of their work is supported by the generous prayers and sacrifices made by the donors to all four Pontifical Mission Societies. On her most recent visit to our office, Sr. Lisa shared with us the charism statement of her order: We, as MSC Sisters, are called to make Jesus known and loved everywhere. Sister feels that this gives her and her Sisters the freedom to be exactly who God calls them to be as His witnesses in the world. The Sisters are nurses, doctors, social workers, teachers…it’s an endless list of professional women sent out into the world to minister to God’s people. You might be surprised to learn that there are MSC Sisters serving the 300 workers of the Ringling Brothers Barnum and Bailey Circus! Sr. Dorothy and Sr. Bernard, who once served in Papua New Guinea, have worked for ten years as teachers and catechists for the child performers and children of the circus workers, most of whom are Catholic and from mission countries. As they travel to perform, the children obviously need to be taught to read and write, but they most importantly need the consistency of Catholic Religious Education. The sisters provide it all, including sacramental preparation; on October 15th, there will be seven First Holy Communions, six Confirmations and a wedding celebrated at St. Michael’s Church in North Andover as the circus makes a stop in the Archdiocese of Boston! Sister Lisa has been a foreign missionary in Peru, Mexico, Haiti and the Dominican Republic where she was called by God to be a teacher. She is quick to remind us, however, that we are all called to be missionaries, no matter where we live or what our work is because we are baptized. This gives us all a share in her Sisters’ charism: to make Jesus Christ known and loved to the ends of the earth. Recently, we were privileged at the office of the Pontifical Mission Societies to be visited by the Most Rev. Antony Pappusamy, Bishop of Dindigul, India. Bishop Antony came to thank us and you, our donors, for all the help he has received since 2003 when he was named the Bishop of this newly formed Diocese. As you can imagine, building a diocese from scratch is no easy task! But, Bishop Antony tells us that with the help of the Propagation of the Faith, they have made great progress. The people of Dindigul are very poor. Most earn less than $1.50 a day to support their families. Many are migrant workers, traveling with the planting season to find work. Bishop Antony told us this hurts the children educationally. Parents either take their children with them, leaving school behind so as not to split the family, or are forced to make the heartbreaking choice of letting the children continue in school, leaving them as what is referred to as “semi-orphans”. They have no one to care for them while their parents are gone. In these cases, of course they turn to the Church. With 112 local priests, 173 Religious women and 27 catechists, the Diocese puts itself at the service of the 2.75 million people of different religions - Christians, Hindus, Muslims – and of different ethnic, social, caste and economic backgrounds trying to uplift the most vulnerable, poor and neglected of their society. Bishop Antony tells us that his biggest job is education on all levels. Finding competent teachers and catechists is very hard in a place where most people are illiterate. But, through support from each of the Pontifical Mission Societies, schools are being built and staffed, parish communities are coming together under the direction of locally trained clergy and the evangelizing work of the Church goes on. This is the work of the Propagation of the Faith and it could not be done without your prayers and sacrifices. As we approach World Mission Sunday, October 18th, a day set aside by the Holy Father for remembering the missionary work of the Church at every liturgy said around the world, may we continue to pray for the health, intentions and safety of Bishop Antony and all like him who work to bring the Good News of Jesus to all.